As temperatures plummet and pollution levels rise in northern China’s coldest winter for decades, Beijing tourists often make their escape to the tropical paradise of Sanya, on Hainan island. With a combination of golden beaches and lush green forest, Sanya confronts the senses with an instant blast of warmth, color, fragrance and beauty as well as the cleanest air in China. Located on the southern tip of Hainan, in the South China Sea, Sanya also offers probably the best swimming in the country. Sanya has escaped many of the uglier aspects of China’s rapid development due to a 2010 decision by the central government to make Hainan an ecologically friendly island. With that, and Sanya’s natural attractions – sunshine, sand and sea – it has become an increasingly popular tourist destination among the Chinese and has a growing reputation among international travelers. Here are some of Sanya’s main attractions. 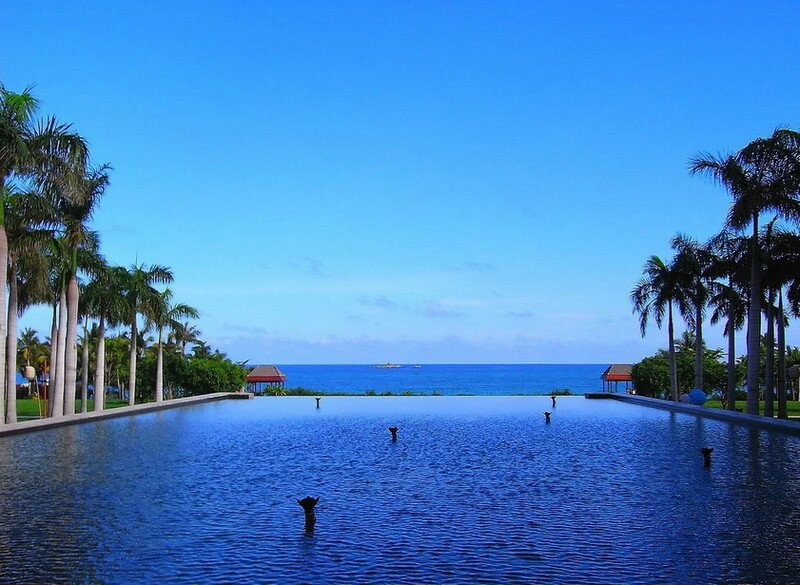 Tianya Haijiao, which means the edge of the sky and the corner of the sea in Chinese, is Sanya’s best-known tourist spot. About 20 kilometers west of downtown, it is a scenic spot, which offers to one side a stunning ocean view and to the other a landscape of undulating stone hills. Two larger rocks stand out among their smaller neighbors and are inscribed with the words "Tianya Haijiao". In ancient times, officials who were out of favor with the emperor were often banished here, as it was viewed as the furthest tip of China and therefore a suitable place to reflect on their wrongdoings. The spot is also famous for the story of two young lovers who eloped here to escape the disapproval of their parents. When their parents tracked them down, the couple held each other tight and jumped into the sea together. In the sea they were hit by lightning and transformed into two stones, which were later deemed to symbolize eternal love. Today, the spot is a favorite for newlyweds, who come here in hope of a long and happy marriage. Along the beach stands a large cone-shaped rock, called Nan Tian Yi Zhu. In ancient times this was said to be the pillar that held up the southern sky. This crescent bay is said to be China’s best beach resort. Often called the Oriental Hawaii, it is renowned for its tropical ambience. It also has five-star hotels and a world-class golf resort. The bay is home to a variety of tropical fish in many shapes and sizes, and well-preserved reefs which are a favorite diving spot. The water here is among the cleanest in China, with visibility down to 10 meters under the water. In the north of the bay is Butterfly Valley, which houses butterflies from around the world, including the Golden Kaiserihind and the Bhutan Glory. Around 50 km from downtown Sanya, Nanshan Culture Tourism Zone is the largest Buddhist site in China. The highlight of the zone is South Mountain Temple, which houses a 108-meter statue of Guanyin, a Buddhist goddess of compassion, inlaid with gold, jade and diamonds. The zone also offers an insight into the local Li and Miao ethnic groups culture. Sanya is known for its seafood, and specifically for Hele Crab. This is a golden crab, which tastes best dipped in ginger and garlic mixed with vinegar. Sour rice noodle soup and mutton are also popular local dishes.